My SIL's birthday is tomorrow, and I purchased a Pandora bracelet for her. I have one that my friend, Maria, bought for me and I love it! I needed something to wrap it in, and remembered seeing this "Box in a Bag" that everyone was making a while ago. I'd always wanted to try one, and it was perfect for my gift. It's actually smaller than I thought, but perfect nonetheless! You can find the tutorial by Diana Gibbs here. I started by choosing my dp. Whenever I do these projects that I've never done and am unsure of, I always reach for a dp that's either retired or not one of my favorites. This dp fit the bill. It's SU's retired Apple Cider and this is actually one of the best ones in the pack. (When I finished this box, I actually really liked it!) I followed the tutorial then added the brown velvet flowers from Maya Road, the SU buttons, and the "string" which is actually thin strips of chocolate chip cardstock (another tip from Diana). I added faux stitching to the bottom and the tab. Now I needed a card, of course, to go with the bag. I decided to use today's sketch challenge on SCS found here. I layered the same dp on top of a piece of really rust and ran it through the Happy Birthday cuttlebug folder. I added the brown grosgrain ribbon and the retired antique brass hodgepodge hardware. The river rock squares were punched out with the scalloped square punch and I added the same velvet Maya Road flowers in a larger size. The matching HPH brad was placed in the center. This card, unlike many of the others I do, did not take over two hours! It only took about 45 minutes! Hey...I must be getting better at this! LOL!! Thanks for stopping by! No, not for me! My girlfriend's daughter is having twins...a boy and a girl! This pregnancy was a surprise for her and her husband and an even bigger surprise when they found out it was twins! She already has two boys ages two and four. She will definitely have her hands full! So tomorrow, her best friend is having a small baby shower for her so she can load up on all the things she is going to need. All she wants is diapers! So that is what she's getting from me (along with some other necessities)! I decided to use PTI's Bitty Baby Blessings because of the "double the love" sentiment. I stamped the images on some Making Memories Animal Crackers dp...one called Ella and the other Jack and cut them out. I stamped the little elephant and bunny on them and layered them on a piece of vanilla that I ran through the cuttlebug using the swiss dots folder. That was layered on a piece of pink pirouette and bashful blue. I used the scallop border punch on both layers and pierced the scallops. I was going to use a coodinating piece of dp for the top and bottom of the card, but I didn't like the way it looked. So, I used this new cuttlebug buttons folder. The sentiment was stamped on vanilla and cut out with the oval nestability and mounted on a piece of apricot appeal also cut with the nestability. The base of the card is also apricot appeal. I took the colors from today's Inspiration Challenge IC151 on SCS found here and this is the inspiration piece I chose. I added a bit more blue because I needed to represent the baby boy as well as the baby girl that this card is for! I'm happy with the outcome...I never know what I'm going to end up with when I'm creating these things! Here's the inside for you to look at and thanks for stopping by! Before I begin I have a question for you...this is a simple card, right? No embossing, ribbons, etc. Then why did it take TWO HOURS to make? I don't think I've ever made a card in less than one and a half hours! Insane! Well, I realized tonight that my BIL's birthday is tomorrow and you guessed it...he's a mailman! 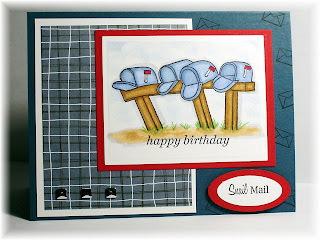 I've never used this Mailbox Greetings set by PTI, and I thought it would be perfect for his card. I saw a version of this on Niki Estes' blog and she said she had never used it either! I stamped it in black, used copic markers to color it in, and a silver pen for the flag. The set comes with grass, snow and leaves to place at the bottom of the mailboxes, but they weren't working for me. So, I just colored some dirt and drew in the little sprigs of grass. The sentiment should have been stamped lower, but I stamped it before I cut it out with the nestability. I also sponged in some clouds to fill in the white a bit. I stamped the little envelope on the Not Quite Navy base in black. The square brads are actually self-adhesive dots I got at JoAnn's. The dp is something very old that I pulled from my stash from a company called Mustard Moon. So, how long do you spend making your cards? I'd love to know! Thanks for stopping by! I went to a baby shower today for one of the girls in my stamp class. She has a seven year old boy and was happy to hear that she is having a girl after trying so hard to conceive another child. 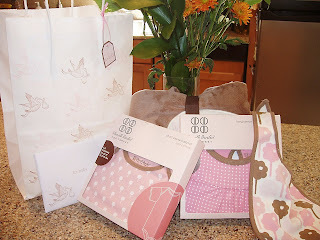 When I went shopping at Target for her gift, I saw baby items in pink and brown...I love pink and brown! I immediately had this card in mind! The sketch is this week's sketch challenge on SCS #198. I used pink pirouette for the base. 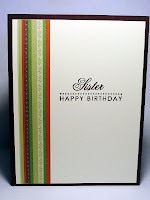 The image was stamped on shimmer white and stamped in close to cocoa. I colored it in lightly with copic markers (I think RV00 and RV02). I also used close to cocoa and bella rose dp. I used the coluzzle for the half circle (the two largest cutting lines on the template). The image and scalloped piece were cut with nestabilities. 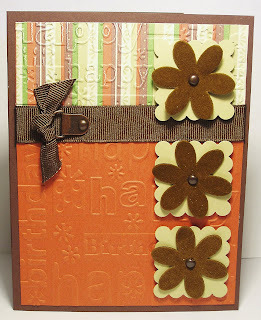 The sentiments (inside and out) are from Bitty Baby Blessings (PTI) and the images are Buggies and Booties (retired SU) all stamped in close to cocoa. I love that velvet cocoa ribbon from SU also! The half pearls filled in the empty spaces at the top. I played around with different background for the pink base (PTI polka dots, linen and sanded bg stamps), but nothing looked right, so I left it plain and added the pearls. Below is a picture of the gifts I purchased for Linda. You can see where I got my inspiration from. I stamped the bag with the same stork image in pink and brown, and punched a cocoa tag and a smaller bella tag, mounted them together and hung it on the bag. Linda really liked the gift (especially the super-soft blanket) and it was fun watching her open all the "girly" baby gifts! That's it for today...thanks for stopping by! Hi all! Thanks to those of you who have been sticking around while I've not been posting! So sorry, but sometimes stamping has to take a back seat to the real world...work, work, work (and some fun in between!). 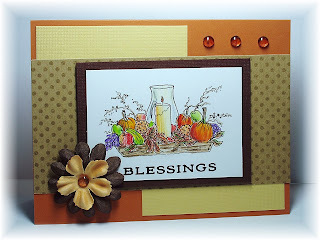 Well, I had my stamp class last night, so I have several cards to share with you. It was a hectic rush to get them done, and I had to case two of them because I was running out of time trying to design my own. In fact, when I was finished designing card #3 for my class, I realized that I wasn't going to have enough dp paper for all ten of my girls that were coming. So, I went to my favorite blogs and cased! Well on with the show! I wanted to do at least one Halloween card, and came up with this one. It uses last year's retired SU Halloween dp because I have three packs of it and wasn't going to invest in the current dp. One of my girls, Judith, had purchased it and graciously brought it with her for "show and tell". 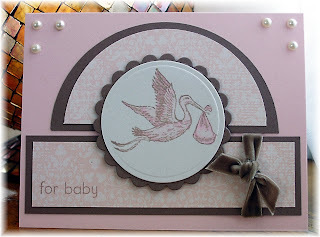 It uses Batty for You stamp set and All Holidays for the sentiment which was embossed with white ep. 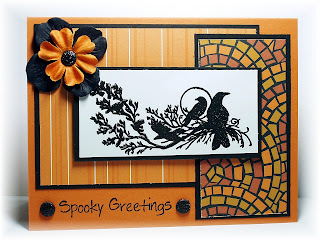 I used black and pumpkin pie inks and paper. The layout is from a Buried Treasure Challenge #BTC02. I don't know where I got this from. When I surf the blogs, I always print out sketches cause I LOVE them...they are so helpful! I always write down the name of the sketch to give credit to the rightful designer of it. The images were punched with a 1 1/4" punch and backed with a 1 3/8" punch and were placed on dimensionals. I used the spider web cuttlebug folder for the background. The spider was strategically placed in the middle of the web! Three black brads finished it off. This next one uses one of my favorite dp papers that SU has put out. 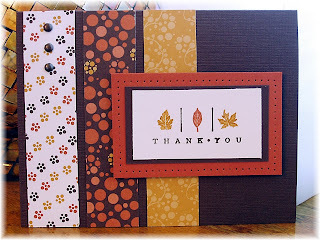 It's called Autumn Vine and is in the Holiday Mini Catalog. I think I have three packs of it because it's so pretty! I used Pocket Silhouettes for the image and PTI's Simple Little Things for the sentiment. 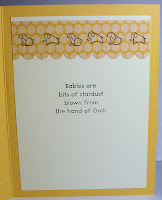 (I did not have this sentiment stamped on the card for my class, as I had to use SU stamps. I put it on after because I am sending this to a colleague who has been out on leave for a surgery. She had a set-back and will be out for a longer period of time than anticipated.) I used Sage Shadow and Chocolate Chip markers to color the main image, then over-stamped it with Sanded in Creamy Caramel. There was too much white on the oval and after several other attempts to compensate for that, I came up with this idea. I used Marvy oval punches and used a white gel pen on the scallops of the brown oval. The photo corner punch filled in the right corner. The sketch came from Holly's (Toy) Dare to Get Dirty challenge DTGDHolly08. OK, so this is the one that almost gave me an ulcer when I finished it. I wanted to use this gorgeous Urban Garden paper, the Vanilla HPH, the Kiwi Kiss textured cardstock, and the matching lucious satin ribbon. Oh, and also the "thumping" technique. After much consternation, I made it all work and got all of the above into one card! The only problem was that the dp I used is the same double-sided dp! Therefore, with only two pieces in the pack, I was not going to have enough for all ten I had to prepare! UGGHHHH! This all came to light at about 12:30 in the morning...on a work night! I left my craft table all frustrated knowing that the next night (the night before the class), I had to come up with two more cards and cut and prepare the paper for all four cards! I didn't sleep well that night! Anyway, I do love this card. I stamped both images (from Fresh Cuts) in Kiwi Kiss, then "thumped" my Not Quite Navy marker on them to get this cool watercolor look. I'll have to find someone to send it to! 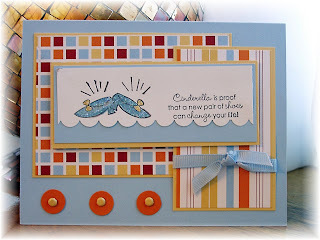 I really wanted to use this new set, Humor in Heels, for my class and cased this card by Dawn Easton. I loved it when I first saw it a while ago, and figured I'd use it. I thought I should change it a bit, so after I stamped the main image and sentiment, I scalloped the bottom edge. 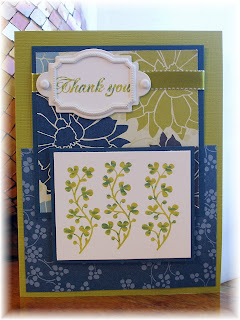 In hindsight, I should have scalloped it first, then stamped (which is what I told my stamp club to do last night). The shoes were colored with a bliss blue and so saffron marker, then a glue pen was used to adhere the glitter. This really made it sparkle in the light! The dp is Washington Apple and the ribbon is bliss blue grosgrain. I backed the saffron brads with pumpin pie circles. It's really a cute card. And last, but not least, is this card. I cased this card from SCS. I went through the SU Take Three gallery on SCS and found this. I just loved it because it used my favorite dp right now, Autumn Vine, and these fall colors. The card below is an exact case, and on this one I changed the stamp. I used more mustard and chocolate chip markers and added the brown brads for the center. 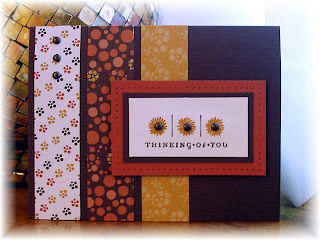 On the card below, I used more mustard, really rust, and chocolate chip markers. Both are lovely cards! 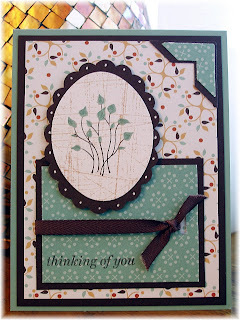 Thanks, Angie for posting such a lovely and easy card to do...it really helped my mojo at the last minute. Well, I hope you enjoyed my post. Sorry for the rambling! On to more cards later! Have a great fall weekend! Oh, one more thing...my friend, Cheryl Rowley, just started blogging (yeah Cheryl)! She is uber-talented and you must stop by, say hello and drool at her creations! Her blog is called Cottage Creations. You won't be disappointed! Before I show you what we did in the Karen Lockhart class I took at my LSS, Buffalo Stamps & Stuff, I have to show you the cutest picture of my little Lizzie. My husband has a pretty extensive garden in the summer and also grows pumpkins for the kids. He picked them today and had them in the wheelbarrow in the back yard. 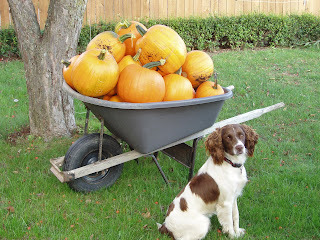 I'm always showing him cute pictures of animals, kids, and gardens that all of you post on your blogs, and he suggested we take a picture of Lizzie in front of the wheelbarrow of pumpkins and post it on my blog! I ran for the camera and we had Lizzie pose for this adorable picture. She wasn't bred as a show dog, but she sure thinks she is when she poses for the camera! Oh, and look at hubby's pumpkins...aren't they wonderful? After I took the picture, I thought we should have washed the dirt off of them! Oh well! On to the Karen Lockhart class. You are probably wondering what the heck kind of card is that? Well it's not a card, it's my scratch sheet of coloring that Karen had us do. She uses Prismacolor pencils for all her images and is a pro at it! 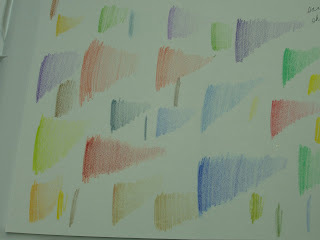 She showed us how we can see the range of color we can get with each pencil. We used the same pressure to get the color on the paper, but to get the darker colors we went over the same line more times and lightened it up as we created these "tornadoes" as she called them. We practiced this with the images she provided for us. This is the first one we colored. I had a hard time getting the yellow to shade properly. I wanted more shading on the criss-cross design as well. 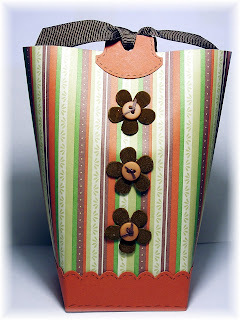 She provided the patterned paper and cardstock and I put this together tonight. I had a really difficult time pulling this card together. It just needed something, and I'm not sure the snowflake is it, but it seemed to work. The sentiment is from SU's Home for Christmas, which can be found in the Holiday Mini Catalog. This is the next image we colored. I really like this tree. It didn't take long to color, so it would be an easy image to mass produce. I used these prima poinsettia flowers I got at Michael's and a Martha Stewart fern punch using SU's garden green paper. The sentiment is from PTI's Believe and is stamped in real red. I used a glitter dot in the center of the flower. Funny story about this card...when I had it all put together, I realized I did it upside down on the card! How many of you have done THAT before? 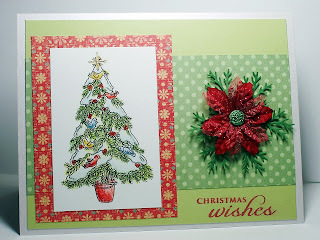 I had to cut it down and layered it on PTI's shimmer cardstock! Boy, does that stuff shine! So pretty! This is the last one and the one that gave me the most trouble! I needed to have her card in front of me as a guide, and the other side of the table kept taking it! I guess they needed it more than me! I do like it more than I did that night, but I wish I would have colored the leaves more green. Karen's had some red and brown in them and mine just came out muddy-looking. I do like the way it looks all mounted and dressed up, though. I used PTI's First Fruits for the sentiment, primas, and dew drops. Well, that's all folks! I enjoyed the class and wish I could have had Karen give me more one-on-one time, but I guess so did everyone else! Thanks for stopping by today! Here's a "quick" card that took a couple of hours to accomplish! I wanted to do today's Sketch Challenge because I really liked this sketch. 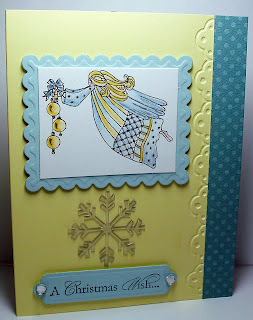 I had some time to start the card before I went to a class taught by none other than Karen Lockhart! (I'll post about that tomorrow cause it's late and I'm tired!) I had the image stamped and embossed and the papers chosen and partly cut. When I came back from my class, I started pulling it all together, and that's when it took more time. It's always the accessorizing that bogs me down. The sentiment is from MFT's Monster Squad. I placed two glitter dots on either side of the sentiment and added the prima flowers and another glitter dot in the center. The dp is SU's retired Creey Crawly. I have lots of it cause I really liked it back then and still do! I'll have to use it up this year. 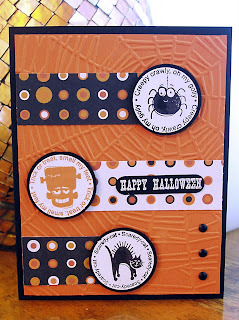 I decorated the inside as well with Clear Art Stamps Halloween Fun (which also takes time, but is so helpful when you want to send a card out quickly...it's all ready to go). I hope you like it. I wish I would have colored the moon in an orangey-yellow...hindsight is 20/20! Thanks for stopping by and I'll try to have a post tomorrow about the Karen Lockhart class!